"Southeast Asians represent a fusion of Mongoloids with 'Australoid'-like indigenous populations of the tropical belt from South Asia to Micronesia"
I agree. But if the Mongoloids are relatively recently derived from northward moving Australoids in the first place how come they are different enough to form noticeably distinct components? "Amerindians are partially admixed with Europeans, and partially admixed with NE Asians; the latter component is marked, perhaps, by Y-chromosome haplogroup C3, and may correspondto the second wave of expansion into the Americas." Dienekes, are you claiming Q and Paleo-Americans are West Eurasian now? ren, how did you infer that I am "claiming Q and Paleo-Americans are West Eurasian now?" from anything I wrote? 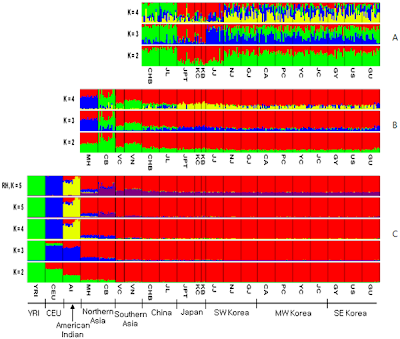 "Southeast Asians represent a fusion of Mongoloids with 'Australoid'-like indigenous popula Micronesia"
Shows that there are unique components for Southeast Asia and S. India. Furthermore Indian populations do not contain the Southeast Asian component and most of the Southeast Asia populations do not contain the S. Indian component. This may call into question a simple southern migration along the Indian Ocean and towards Australia thus resulting in an Australoid Population; whereby both the Southern Indians and Southeast Asians would be partly descended from them (along with some northern populations). Or it could still be the case that the southern migration took place (with both Indians and Southeast Asians partly descended from them) but it happened so long ago that the Southeast Asian component had time to differentiate from the S. Indian one. If the second scenario is true it is still unusual that the Southeast Asians are so distant from the South Indians. Also it appears that both the Koreans and Japanese do not have any significant Southeast Asia contributions that the Mongolians wouldn't have (which is basically nothing). So I'm guessing the onset of wet rice farming in Korea and Japan was due solely to cultural diffusion and not demic diffusion. 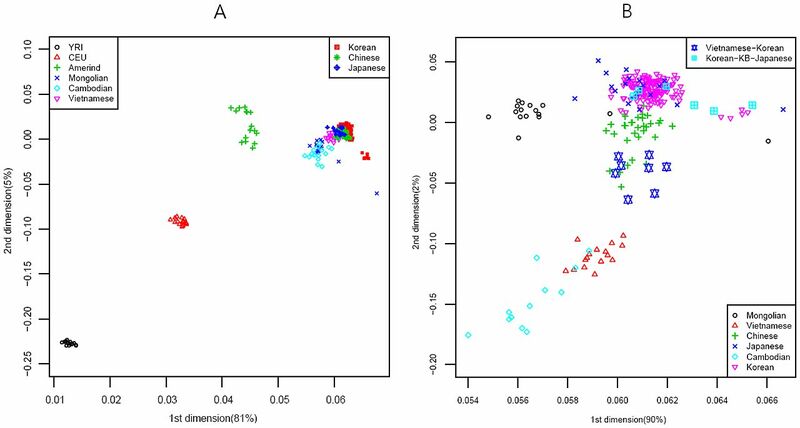 I wonder if anyone has done work on genetic indications of class stratification in Korea or Japan. Both societies have long histories of strongly hierarchical societies, with feudal aristocracies and strong class assortive arranged marriage patterns. In Korea there was a few generation period of forced including of Mongolian princesses into aristocratic bloodlines, and high caste Han Chinese were probably incorporated gradually into local bloodlines over time. Until recent times (e.g. import of brides into rural Korea from SE Asia), the lower classes have had, in contrast, very localized pools from which to seek spouses. The institution of concubinage might also have differentiated high class from low class populations. While the differentiation may not have been quite a strong as that of India, the formative period of that differentiation may have been more recent, so the genetic signal might have comparable strength. The only work along those lines that I am aware of is the differentiation of probable Joman patrilines and matrilines from latter migrating populations. 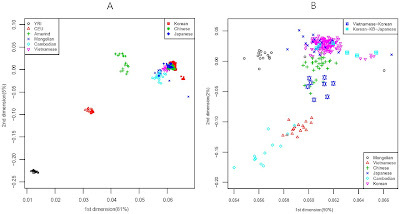 Japanese and Koreans share the common Yellow cluster when K=4 which is less observed among others on mainland, suggests that the ancestral groups migrated to Japan via Korea, while Jilin(Manchuria) Chinese and part of Koreans share the Blue cluster with Mongolians, suggests that the later North nomads（or Hunters) didn't migrate to Japan. "This may call into question a simple southern migration along the Indian Ocean and towards Australia thus resulting in an Australoid Population; whereby both the Southern Indians and Southeast Asians would be partly descended from them (along with some northern populations)". I think it's safe to assume that if migration from India into SE Asia was so easy in the Paleolithic it should have remained so for much of the time since. Therefore the 'simple southern migration' theory has never made sense to me, partly for the differences between SE Asians and S Asians you refer to. Hence my first comment at this post. Unlike the lack of evidence for an Indian connection it seems extremely likely that over time people from the north have made a substantial contribution to SE Asians genes, without even considering any genetic evidence. For example it looks to me as though several language groups have periodically moved south into SE Asia. I would guess that the oldest surviving language in SE Asia appears to be Mon-Khmer. Its distribution has been splintered by the arrival of several later languages. But it probably replaced a yet earlier language family, perhaps related to some Papuan family or families. I suspect everyone here would accept the existence of a 'Sino-Tibetan language family'. Speakers of Han Chinese have definitely expanded south over the last several thousand years. Presumably 'Tibeto-Burman' is a sub-branch of Sino-Tibetan. But if Tibeto-Burman is a sub-branch surely that branch must be younger than Sino-Tibetan as a family. Therefore the Burman languages are probably relatively recent into Burma and Northeast India. And it seems obvious that they replaced other languages already established in SE Asia. Austronesian may or may not be distantly related to Sino-Tibetan (I suspect it is) but its expansion (most likely from Taiwan, or the Philippines, or both) is presumably no older than 5-6,000 years old. It too looks to have replaced earlier languages, mostly coastal. The other SE Asian language family that may predate both Austronesian and Tibeto-Burman is Thai-Kradai. It is presumed to have entered SE Asia from southern China, again relatively recently. So, SE Asians seem to be some indigenous population remnant that has been swamped by later arrivals from the north. No evidence of any movement from India to SE Asia until Hindu and Muslim traders entered the region. But plenty of evidence for southward-moving immigrants. "I would guess that the oldest surviving language in SE Asia appears to be Mon-Khmer. Its distribution has been splintered by the arrival of several later languages. But it probably replaced a yet earlier language family, perhaps related to some Papuan family or families". Sorry about that. A mistake. It's the Hmong-Mien languages that I was refering to with that comment. As far as I'm aware the Kmer are also relativley recent into SE Asia.